Atlantis takes flight on Dec. 2, 1988. In this historic photo from the U.S. space agency, Space Shuttle Atlantis takes flight on its STS-27 mission on Dec. 2, 1988, 9:30 a.m. EST, utilizing 375,000 pounds thrust produced by its three main engines. 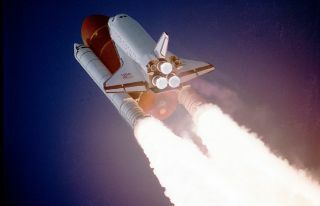 The STS-27 was the third classified mission dedicated to the Department of Defense (DoD). After completion of mission, Orbiter Atlantis landed December 6, 1988, 3:36 p.m. PST at Edwards Air Force Base, California.